Reunion 2006 was a great success and a big thank you goes to Don Campbell for putting up...er, for putting it together! Hooah! 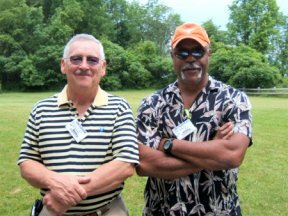 Big Red One Members - CTT #5, CTT 13 & 61st IPCT: Kneeling L to R: Ed Wheeler, & Jerry Pritchett. Standing L to R: Don Hendricks (LT); Norman Shaw; Tom Auer; Jearald Dudley; Chuck Steward and Denzil Lile. "No Mission Too Difficult, No Sacrifice Too Great - Duty First"
CTT #13 THEN: From L to R: Seated on the ground is Don Ferraro with Bruce; Bill Grady by the tree; Steve Tesdall in the back of the truck; Jerry Scott by the star; Ed Wheeler and Sam in the forefront with Jerry Pritchett sitting behind Sam; and the smartest guy of the bunch catching the shade under the truck - Norm Shaw! 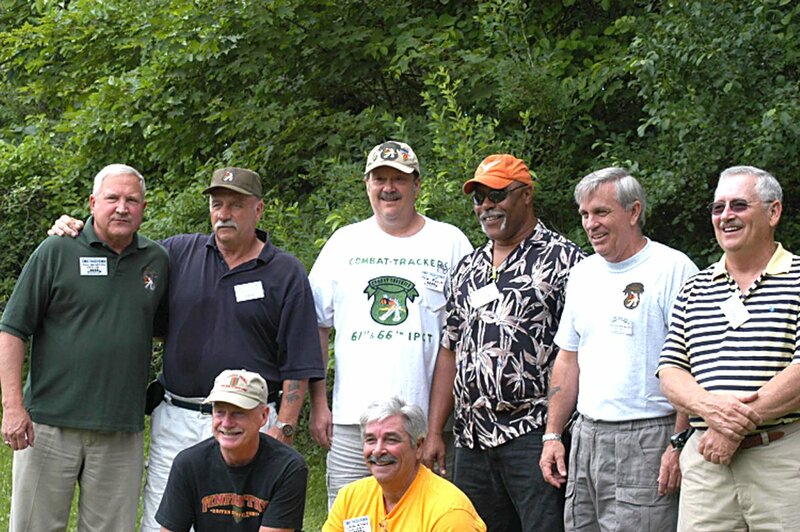 ; with Willie Cox standing on the far right. The weapons by the tree are the M16 on the left, and the Handler's favorite CAR 15 on the right. 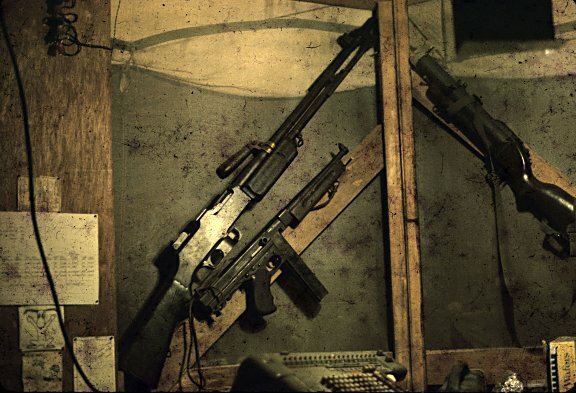 CTT #13's Weapons of Choice: From L to R: Roy Burchfield's BAR; LT. Hendrick's Thompson 45 Submachine gun (substituted for his M16 which jammed on the first mission! ); and Willie Cox's M79 Grenade Launcher. Business as usual. Thanks for the photos, Don - and I'm waiting for more photos to be sent in to share more of this year's Reunion with everyone! 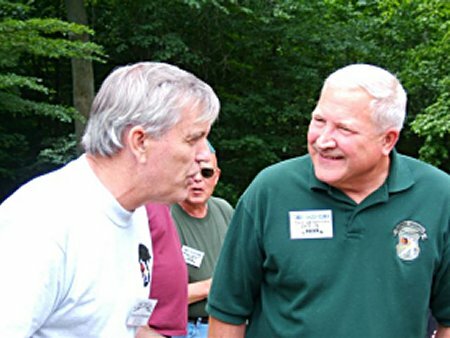 Starting here-Ed Wheeler (CTT #13) sent these GREAT photos from the Reunion - Thanks, Ed! 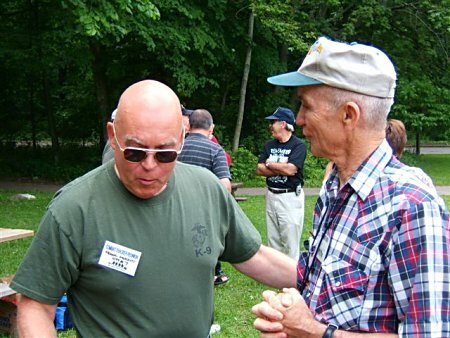 Chuck Steward - 61st IPCT and former CO of CTT #13 Don Hendricks with Frank Merritt looking on in amazement! The reason? Chuck is saying, "Don, I remember that scorpion! It was at LEAST four feet long - huge, bloody fangs, biggest thing I've ever seen...." Don is delighted that someone has finally verified his account of the giant scorpion! 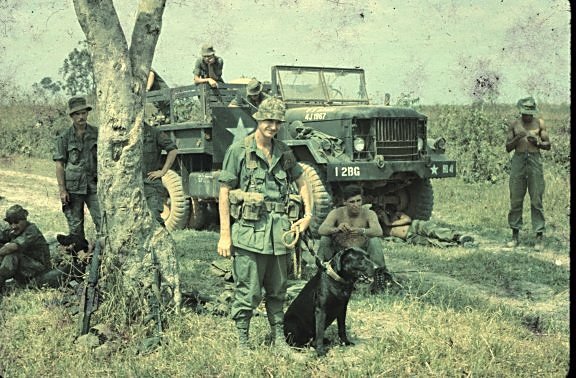 Denzil Lile and Jearald Dudley of the 61st IPCT - 1st Infantry Division. As you can see, these guys are in very good shape - and I'm trying to recruit them for the new Tracker training program. Denzil and Jearald, keep your eyes out - the black choppers will be in your vicinity very soon. Pack light! Frank Merritt - CTT #7 - 1st Cav - is receiving some bad news. 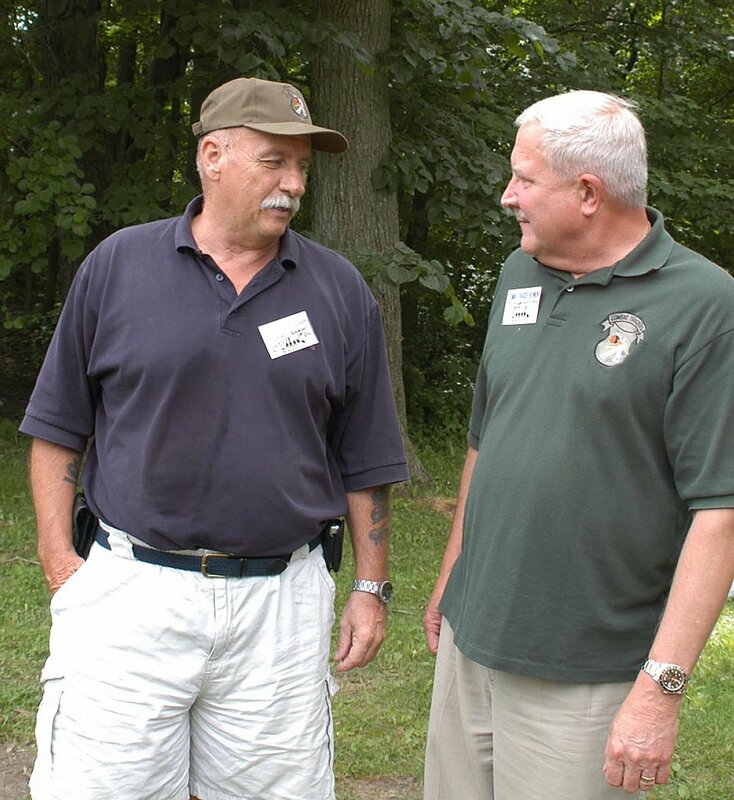 Bill Welch, the USARV liaison for the CTT program with the Brits at JWS, is finally telling Frank the real skinny. "Actually, Frank, the Labs were always in charge of the program. We knew that they would train the handlers - and then be in command of the entire team. It would just take a while for them to establish their authority, but they were well prepared for their missions."